Jake Tarca was dangerous inside forward 50 with two goals on debut. Geelong’s VFL side has come up short in their opening round clash with Richmond, falling to the Tigers 12.11 (83) to 14.13 (97). The Cats started the match slowly and seemed to be chasing their counterparts’ tails for much of the first half. However, two five-minute bursts in each of the two opening quarters saw the home side stay within seven points of the Tigers at the main break. 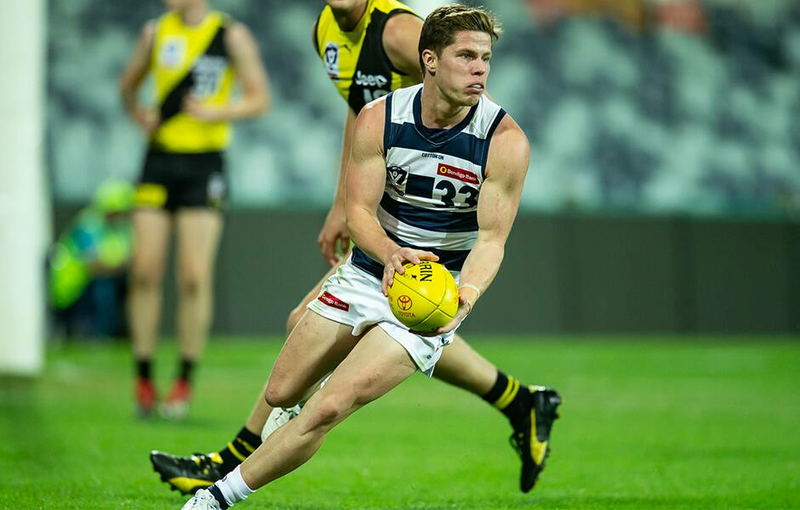 The Cats kept their opponents scoreless for the majority of the third term and were able to take a slender lead into the final change. Geelong’s time in front was short lived as the Tigers started the final term with four quick goals. The Cats rallied late in the term, but it was a to no avail as the Tigers ran out 14-point victors. Cats coach Shane O’Bree lamented his side’s poor start to both the first and fourth quarters. “The Tigers got a hold of us around the contest, we couldn’t get our hand on the ball and they scored four goals, so we were on the back foot early,” O’Bree said. It wasn’t through lack of trying, and O’Bree was impressed with the effort of numerous players who were thrust into multiple positions in an attempt to get the win. “We tried a lot tonight, we tried different mixes in the midfield and swung players into different positions which got us back into the game at times,” he said. One of those players was Wylie Buzza who filled in key position roles at either end of the ground and finished with two goals to be amongst the Cats’ best. “Buzz started really well as a forward and then we had to throw him back and he adjusted to that pretty well,” O’Bree said. Defender Zach Guthrie was also rock solid down back, taking numerous intercept marks while racking up 16 disposals. Guthrie showed his intent to return to the AFL side, as did James Parsons (18 disposals, eight tackles) and Sam Simpson (14 disposals, five inside 50s). VFL listed forward Charlie Wilson had a profound impact in his debut in the blue and white. Wilson had 15 disposals, 13 by foot, multiple goal assists and his work at centre clearances was instrumental in getting the Cats back into the game. “Charlie playing his first VFL game, for a young fella he was terrific, with his ability to get after the ball and meet the Richmond players head on,” O’Bree said. Consistent midfielder Jordan Keras was among the major ball winners on the ground, racking up 20 touches to go with nine tackles and a goal. The VFL Cats will look to get back on the winners list next week when they return to GMHBA Stadium to take on the Northern Blues.